The Three of Swords is sometimes known as the “war” card, but it can also symbolize relationship heartbreak or any other mental anguish. 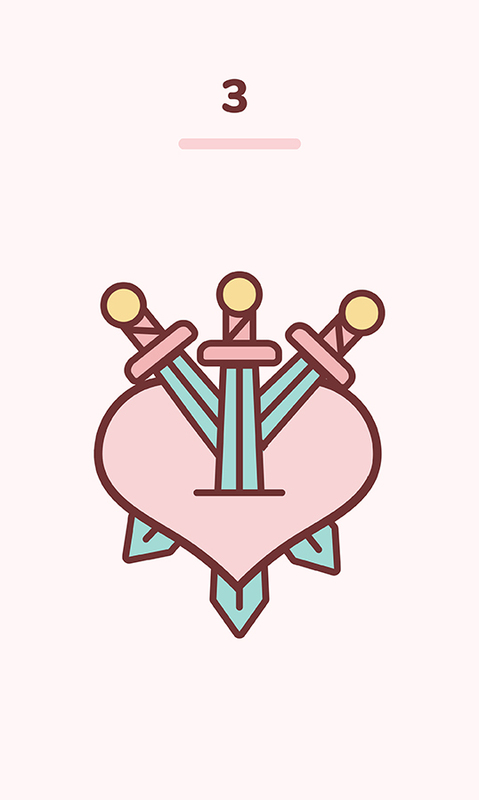 Although the number 3 signifies creation and this card is a descendant of the nurturing card of the Empress, the suit of swords is about big movements and big changes. This is a case where when something is created, something else must be destroyed. You may find this process very painful, but something beautiful will come from it. If you have drawn this card, what hurts you may hurt most because it was not what you were expecting. The Three of Swords often encompasses unexpected reversals of fortune or sudden abandonment, rejection, and betrayal. This sorrow is necessary for you at this moment. Without the pain, you would have no motivator to get through to the other side. The Three of Swords encourages you to challenge your negative thinking and instead see it as a symptom of a temporary unwell brain. Though life may seem meaningless at the moment, you shouldn’t make any decisions at this time. This is a time for recovery. With the Three of Swords reversed in a reading, it can indicate you are on the road to recovery after a difficult time. You have been exercising a cautious optimism, and congratulations, that energy is now at last starting to return to you. Continue to count your blessings and thank the Universe for the people who support you. This situation has affected you deeply, but thankfully you are seeing the silver linings and finding other things in your life to be happy about.